Leadfeeder is making big waves in the website visitor identification market. Head of Marketing, Christina Hall, explains how the company is competing and winning customers in an already crowded marketplace. 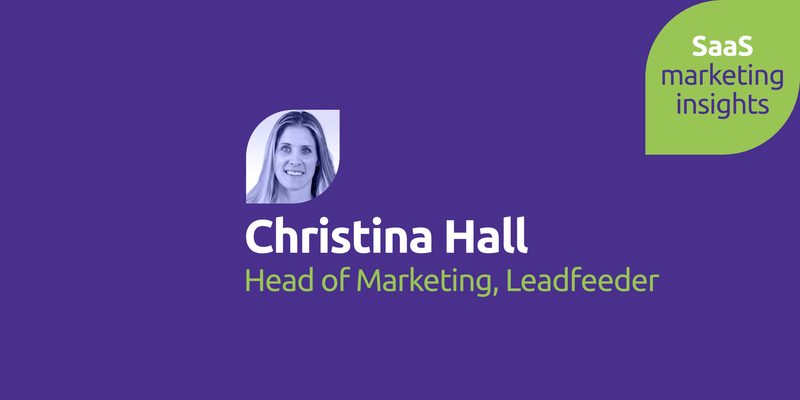 Paul: On today’s show I have an interview with Christina Hall, head of marketing at Leadfeeder, hope you enjoy it. So Christina Hall from Leadfeeder, here at SaaStr in San Francisco, sunny San Francisco. Fantastic weather, your first time at SaaStr and mine too, what do you think of the show so far? Christina: So, I love the sessions, there’s been some interesting ones, generally there’s a lot more people here than I expected so yeah. Paul: it’s a throng, a mighty throng, let’s say 10,000 people I’m not sure. Christina: Yeah that’s quite a bit for this small hotel but yeah I think it’s great. There’s been a lot of good networking that we’ve been able to do and I even saw some customers of ours in elevators and in passing which doesn’t hurt so yeah it’s really good event. Paul: So, tell me about Leadfeeder and what you guys do. Christina: Yeah so our tool basically sits on top of Google Analytics and we identify anonymous website traffic for companies and so companies use our tool to better understand if they could use the visitors coming to their website as part of their sales process. Whether it’s about reaching out to companies that are within their sales pipeline or reaching out to contacts and interesting companies that would be a good fit for their business and making that one-on-one connection. Paul: So it does that with reverse IP look ups? Christina: So actually since we are a Google technology partner we directly use the data from Google with IP addresses and we match it. Paul: Oh right, so you use the Google Analytics API or something like that? Paul: Ok, that’s a bit techy. Christina: Well yeah it is, the whole technical process is techy but basically that’s how it works. Paul: So you’re in a really competitive space, lots of people in that space, I used to work with Lead Forensics in the UK, how do you guys differentiate what you’re doing from from say some of the other players? Christina: So, that’s a good question because this space, the category has become crowded and there’s companies like you mentioned Lead Forensics and a lot of other similar companies that just offer this feature to customers meaning website visitor identification. There’s other companies such as robust marketing automation tools that offer a full suite of features in addition to website visitor identification. That’s part of their offering and so different regions, different markets have different players. We come across competitors based upon typical market share type of things so in the US for instance, HubSpot for our customer base owns a pretty large market. So typically we’re having to convince customers to switch or to use Leadfeeder in addition to their HubSpot CRM or HubSpot marketing platform. Paul: Ok, so if I’m a HubSpot customer, sell me how Leadfeeder adds to that or complements it. using this for that feature because we can identify you 5X, 10X, 20X more companies for you and that gives you much more ability to connect with prospects. Paul: Fantastic, so you’re with Leadfeeder now but as I understand it you’ve got quite a history in SaaS/software marketing, you must have had some things that worked really well for you and some things that bombed terrifically. We don’t need to know the companies or whatever but just interested in your experience, something that worked well, something that didn’t work so well. Christina: Yes, so I’ve been, I kind of fit at the intersection of sales and marketing as a professional and I’ve been on both sides. Paul: What do you call that now? Christina: Well i guess there’s that ‘smarketing’ terminology, whatever that means. It means something different to everybody but I’m so used to understanding revenue generation in sales and now as a marketer that’s, you know, revenue generation as a marketer. My sales career helped me to be a more focused revenue generating marketer and not to be in a support position necessarily but really how can marketing impact the business and so that’s really you know where I fit as a marketing professional or marketing leader today. It’s within that demand generation space sure. I’ve done a lot of things that you know have impacted the business, a lot of things that haven’t. 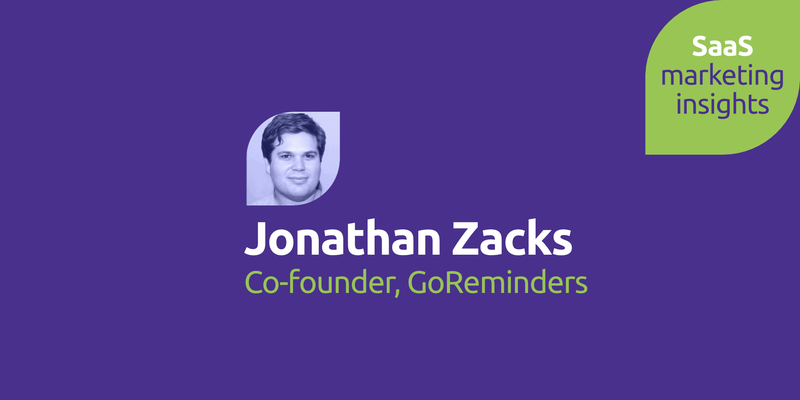 For one company, before I started working for Leadfeeder I was working with a really cool tool called Sub Central and they were just going to market, just kind of finding their product-market-fit and just determining who their customers were. 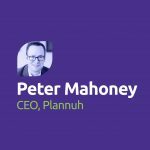 Paul: Thats hard from a marketers point of view, a lot of work you have to do. and so the approach for them was to identify, kind of their high-value prospects in a direct way. By going out and looking at companies and contacts that sit within a potential ICP, a potential customer profile and then reaching out to them, again very non-scalable methods of email and then we do some retargeting ads based upon their activity and whether or not they responded to our emails. Christina: It went, the company was very happy, they generated about 50,000 in the pipeline from kind of the sales development effort so that wouldn’t work for Leedfeeder for instance, we don’t have, we don’t place a high contract value. Christina: Right, dictate, dictate the channels and what we do to generate interest and so going back to your question about you know what is working. So for Leadfeeder specifically we’re finding a lot of, we’re writing a lot of really indepth interview style blog posts. With those articles that we’re producing, writing and creating we’re driving pay traffic to those. Most companies three to five years ago which seems like ages ago, they would create these white papers and ebooks and whatever and turn them into gated assets. Paul: So you’re using paid to drive people to content? Christina: To really rich content, so really democratizing content. Paul: So you’re building that trust, that credibility with them, then hopefully they’ve got a problem that you can solve. Christina: Then we re-target them so yeah, it’s really for us right now, it’s about traffic generation and we have a single sales funnel which is our free trial sales funnel, which is what we serve in retargeting ads for instance. I’m of the thought as a marketer now to democratize content and so that’s really our notion and creating really robust content assets for that. Paul: So contents a nightmare as well though because there’s so much of it out there, how do you differentiate with content in a sea of content? It’s got to be really high value stuff right? Christina: Well there’s SEO value right and then there’s the promotional value and so there’s a lot of new tools now that help to get traffic to content. Paul: What are these new tools? Christina: Well, have you heard of Zest? It’s a Chrome extension so you can publish content there. I actually have a bookmark or it’s not bookmark but it’s the Chrome extension that comes up on your browser window when you open it so every time I open my browser window I see the Zest list of other published content. I kid you not, every time I open my browser I’m like wanting to type in a URL but then my eye catches something interesting and so I click through. Paul: How do you get any work done? Christina: it’s difficult, it’s difficult but it’s an interesting tool so it’s an interesting platform to kind of, again going back to democratizing content, the method of that is really valuable for marketers and you know obviously there’s growth hackers and subreddits that have worked for us and some social groups that drive us traffic. It’s an interesting process to get the right traffic sources to our webpages and to our content and then the end game of serving retargeting audiences that then convert into free trials. Paul: Retargeting is much cheaper, more effective, higher conversion rate. Christina: Yeah, so taking them from the top of the funnel and to the bottom but it’s very direct and it’s a very simplistic process of what we have laid out right now. Paul: I love it, I love the simplicity of it that you’re not trying to do a million different things, just running one or two things, obviously you’re running some experiments, you’re measuring everything you do, sounds super smart to me. So you’re a Busy mom, you’re a full time marketer and a busy mom, you’ve got two kids, how do you balance all of that? How do you make sure you don’t burn yourself out? Christina: Yeah, you know it’s… yeah so anyone listening, any woman in tech right or any woman who has kids or man too, it’s not just a woman thing. Paul: No, men hear that, there’s too many men in tech out here. Christina: Yes, and men have kids right. Paul: Men do have kids, it would be a terrible world without that. Christina: Exactly, so I think it’s about, for both genders, balancing the workload of being able to fell like you’re contributing and sharing the workload. Thankfully I have a supportive spouse which I know not everybody has but really sharing in that together is what it boils down to. Then you have to, you have to draw the line and so I think I mentioned earlier, we’re a remote team and I work from home. Sometimes after dinner I want to just do something in my office and I have to say no and I have to draw the line. I have to wait until they’re sleeping or in the morning and kind of just focus on one activity and give them 100% in that moment. Whether it’s work or whether it’s with family. Paul: So it’s quality work time, quality home time and just sensibly partitioning the two. Paul: So you probably don’t have time to do much else but how do you kind of relax when you’re not either working or with the family? Christina: I mean it’s nice to relax with family right, enjoying your family is one of the reasons why you have family. So with that, we go to San Diego Zoo and Sea World and kind of try to enjoy what San Diego has to offer which is nice. Paul: This is brought to you by the San Diego tourist board. Christina: Haha, I know right, but yeah if you haven’t been to San Diego, It’s a great place to visit I’m telling you, it’s great weather, beautiful beaches. Paul: So final question for you because you’re busy here with Leadfeeder. Are there any sort of particular, particularly good books on marketing or sales, something you read or you think you would refer other people to read? Christina: Yeah so I’ve actually, I have read quite a few books, you know traditional entrepreneurship and sales marketing books but nowadays I like to meet other companies blogs, I get sucked in. Paul: Blogs are the new books? Christina: I suppose so, certain blogs. Christina: So, intercom is one blog that I visit frequently and every time I visit their blog I get sucked into something that’s like oh that’s cool, that interesting. I guess what they do differently and it’s part of their content process from what I read on their blog. Which is interesting to me as a marketer is that in lieu of hiring marketers to run content they hire content, actual editorial content writers. So, whereas that content marketing manager type who’s really focused on leads or revenue has some kind of strong KPI goal in mind which is a goal of content but that’s a byproduct. So if you find people who can really write good things, understand who it’s for. Paul: A good writer is a writer. Christina: Yeah and that attracts an audience and so that’s just with any content, so I think intercom being as big as they are they can probably do that and not make it as though every piece of content they produce has to have an end goal. Paul: Yeah or be SEO’d to death. Christina: Right but either way I think that they’re doing a pretty good job when it comes to content. Paul: Any other blogs? What about Leadfeeder blog? 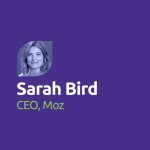 Christina: Of course the Leadfeeder blog, yeah so we are working with an agency right now: Growing Converts, to helped us with those really great interview style articles that we’re producing for the blog. Paul: Yeah, they’re hard work. Not the agency, the creating of the article. Christina: Right, yeah so the workload has been passed to them mostly for their production end of it which has help us. We’re pleased with the quality of what they’ve been producing. Drift is another company that I admire in terms of the content that their producing. Paul: Yeah they’re very much conversational marketing and very transparent and they’re killing it out there at the moment in terms of marketing. Going out there with a different tone, fresh approach. Christina thank you very much for your time, it’ been great, I really appreciate it.